So The Night Manager might be getting a second series. Nothing’s been confirmed but the BBC aren’t ruling anything out as more and more eyes are drawn into the fantastic spy story airing Sunday nights on BBC1. We all love mystery series here in the UK and The Missing was one of those series that got everyone talking when it aired in late 2014. It revolved around the story of a family ripped apart when their only child was kidnapped in France. The last episode very nearly resolved everything when it was revealed that the owner of the B&B the parents were staying at had run the boy over and had called in a favour with his brother the mayor to cover it up. The writers then blew it all by having the father come face-to-face with an older boy in Russia who may or may not be his son. Oh and now we have a second series. The problem with this is that The Missing was pretty much like reading a page-turning novel you can’t put down. You want to get to the end but you don’t necessarily want to see a sequel because it would ruin the feeling that the ending and the story as a whole left you with. The second series hasn’t aired yet and it could be a massive hit but I doubt it. A bit controversial since some people enjoyed the second series but renewing this series felt a lot like bosses having their cake and eating it too. In this case I got halfway through the second series and my opinion wasn’t swayed. As you’ll recall, the series was similar to The Missing. It revolved around the mystery of a boy, this time found dead under some cliffs. And we got to see how the murder impacted the whole town. If ITV had advertised this as the 21st Century’s answer to Twin Peaks, then a second series may have been justified. But instead the assumption was that it was a murder mystery. The second series ‘rewarded’ viewers with a dragged out trial and while there was some fantastic acting, the writing just wasn’t there. Oh and apparently this will be a trilogy. Ugh. I suppose with the examples cited above, they are both mystery series focusing on one case, which gives the viewers the expectation that the story would last for one series. Whereas the following dramas would lend itself well to another series. Easily the best new drama of last year, it told the story of a new type of robot called synths, robots that looked eerily human and obeyed our every command. In theory. Unfortunately a couple of synths didn’t get that message and what we got was a story of how these robots crept into every corner of human society, through the eyes of a human family and a synth family. Compelling because humans as a race are stupid enough to make this future a reality, it left a lot of things unresolved. How far would we let synths develop before we realised too late we’d gone too far? Would there be a synth apocalypse? Would people be wondering around in vests killing synths pretty much like The Walking Dead? (Note: I’ve never seen The Walking Dead but I have that image in my head every time I hear the show title. Go with it). There’s a lot of ground to cover when this series returns. When I first heard the idea, I genuinely thought this wouldn’t work. A bunch of Dickens characters running around the same street? The future Lady Dedlock and Fagin living in close proximity to each other? Too unrealistic! What we got instead was a soap opera that was good, based on the stories of the man who wrote the first ever soap opera. Despite the pre-watershed timing, things got dark with murder, child trafficking and faking the death of a baby all touched upon or shown. It was like watching EastEnders. Except with good writing. And good acting. And more happiness. OK it was nothing like watching EastEnders. My point is that there are years worth of story to be mined. I imagine Oliver Twist will be played out in the next series. 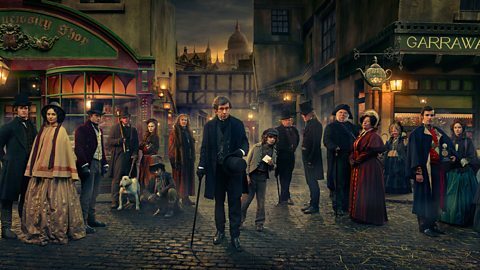 Great Expectations will be down the pipeline, A Christmas Carol will obviously be a Christmas Special and it will be a crime if Mr. Micawber and his family from David Copperfield don’t show up at one point. If they keep going, they can even do Bleak House in twenty years. Okay maybe that’s pushing it. In case you haven’t worked it out, the theme here is all to do with how these series ended. The Missing and Broadchurch both ended things nicely with just enough ambiguity to leave people wondering (but not enough to leave them wanting to find out what happened). Whereas Humans and Dickensian both have unresolved endings that lends itself to more and more series being made. It’s something that sadly bosses don’t consider when they decide what to re-commission. TV dramas are like reading stories. The ending must be allowed to happen sooner or later. No matter how good these dramas turn out to be.